I’ve got some extra back to school shopping to do this year. Nate’s off to middle school in a public school so he has more supplies to get as our Catholic school sells their own supplies. I was looking for good deals online and stumbled across this new feature on Target’s website – the School List Assist. Visit their School Supply page and click on the pen up top titled “hassle free back to school shopping” to get to this tool. It curates your list and you can check items you need off as you go. 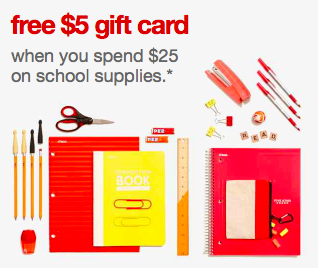 Also they have some sales going on right now – spend $25 on school supplies and you’ll get a $5 Target.com gift card. Most of the school supplies are on sale too so you’ll be getting everything discounted.